It can be very upsetting and frustrating if your luggage goes missing en-route to your holiday destination and no matter how many essential items you pack into your hand luggage, a lost suitcase can easily ruin your holiday. Most travellers are reunited with their luggage within a day or two but if the flight label has become detached from the case, you could be waiting several weeks before you see your possessions again, if at all. Last year, more than 23 million* bags and suitcases were mishandled around the world, causing inconvenience and frustration for many holidaymakers. However, by taking a few simple precautions, you can help to ensure your well-deserved holidays go without a hitch. 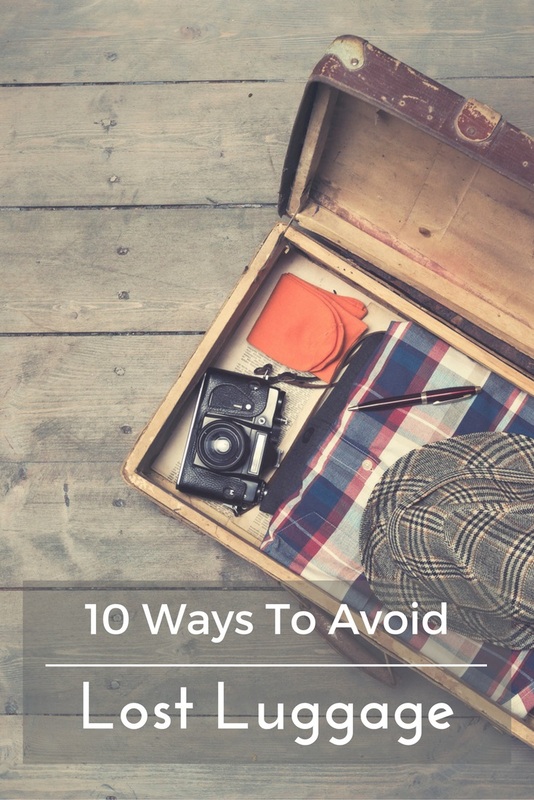 Take a look at our top 10 tips for ways to avoid lost luggage and other baggage problems. Mishandling of bags when switching planes accounted for 45% of all baggage delays last year*. Keeping the number of transfers to an absolute minimum will significantly reduce the risk of your luggage going missing in transit. Before you set off take a picture of your bags, packed items and your baggage claim ticket in case they do go missing and you need to prove they belong to you, or an official needs to identify them. It is also a good idea to make a comprehensive list of everything you’ve packed in case your bag is never recovered and you need to claim compensation. Keeping a close eye on your bags is the best way to prevent any problems at the airport. Unfortunately, there are unscrupulous people circulating at airports so make sure you can see your luggage at all times, whether you’re in the check-out queue, enjoying lunch in a restaurant, shopping or relaxing in the airport lounge. Ensure you don’t lose anything essential by keeping expensive and important items in your hand luggage including medication and emergency items – if there is a delay, you’ll have your tablets and anything else you absolutely need. Remember to remove any old flight tags, stickers and labels from previous trips before you check in to avoid confusing baggage handlers. Getting some additional security for your baggage before you jet off will lessen the chance of anything been stolen from your luggage or it going astray on a long journey. Zip ties will put thieves off tampering with your bags, as they simply make them harder to open. Similarly, snapping a padlock onto your case will make sure that no-one opens it other than those who are sanctioned to do so. There is also a range of high-tech luggage tags available which feature codes or microchips that allow travellers and airline staff to detect lost luggage. If you’re running late you’re increasing the chances of error, and there is the risk that bags that are checked in late might not make it onto the plane. Baggage handlers need to process your bags and load them onto the plane, with most experts recommending checking in at least 30 minutes before departure to give them enough time. This makes it easier for an airline to locate you, especially if you are on an outbound flight. It’s also worth including some contact information – include your phone number and email address but leave out details such as your home address. If you own a generic looking black suitcase then a case of mistaken identity at the baggage carousel could also put a dampener on your holiday. Add a brightly coloured luggage belt, tie a ribbon to the handle or use some brightly coloured sticking tape to make it easily identifiable. Airlines are liable for lost, delayed or damaged luggage but there aren’t any regulations that fix the amount of compensation available, meaning you could be left out of pocket if a particularly valuable case is misplaced. To avoid this, ensure your travel insurance policy includes personal baggage cover and insurance for delayed baggage.